Early one June morning, a few days after the Tololing operations, the wireless set in the underground Signals center crackled. There was an emergency in Batalik. The army had suffered setbacks while advancing on a feature near Jubar Peak. A signalman went running to the helidrome where six young Army Aviation Corps pilots sat sipping their first cup of morning tea. 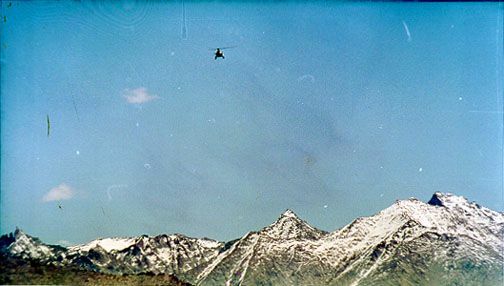 "Emergency CASVAC (Casualty Evacuation) in Batalik," was all the signalman blurted when the pilots began sprinting towards their helicopters at the helipad. Such was the emergency that while the six pilots strapped themselves to their three choppers, they were given the exact location in Batalik sub-sector where they had to land. There were around 15 casualties, mostly serious, according to the information that came in. The single-engined Cheetah helicopters, originally of French make but made uner license at Hindustan Aeronautics Ltd (HAL), Bangalore, are light and extremely useful at high altitudes. However, they are incapable of carrying large weights and in each sortie, the two pilots in one chopper could only bring back one injured soldier. As they took off, the pilots realized that they had a long day ahead, for 15 casualties were only for starters. It took about 20 minutes flying time to reach the Batalik helipad, almost 66 kilometers by road from Kargil. The Cheetah helicopters flew low, hugging the rugged mountain terrain. 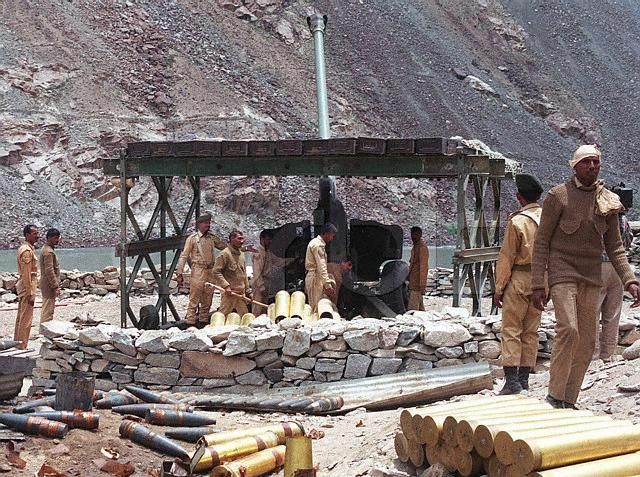 In these early weeks of the war, Pakistan still dominated most of the commanding heights in the Batalik sub-sector and after the Tololing incident on May 28, the Indian Army and Air Force pilots knew that Pakistanis were armed with surface-to-air heat seeking missiles.  Therefore, the helicopters could not afford to be seen above the ridgeline over the horizon. The pilots flew below the ridgelines in the Valley, often with just about enough space for the rotors between two parallel mountains. The daredevil pilots of the Sharifabad and Leh-based army aviation units flew innumerable sorties during the two-month long Operation Vijay and continue to do so even now. The landing at Batalik was uneventful but as soon as the first casualty was loaded in the chopper, plumes of smoke and dust rose on the mountain peaks opposite the makeshift helipad. The nursing assistants panicked. The enemy holding the peaks had opened fire with what appeared to be heavy caliber guns. The pilots were already sitting strapped to their seats and the rotors were still whirring. "Quickly, shut the door," they seemed to signal. Dust flew in all directions as the first chopper took off. The other two also just about managed to take-off in time, in the case of the third chopper the pilot leaned backwards to fasten the door of the helicopter himself, as the panicking nursing assistant fled into the bunker without doing so. Moments after the chopper took off, splinters hit the helipad and got embedded into the walls of the medical room nearby. "Saved by the skin of our teeth," Major Ajay Ramakrishnan and Major Rajeev Dua, the two army aviation pilots cheered that night, safely back in Kargil. Their colleagues, Major Prakash Ruthiyar, Captain Ghuman and Captain HKS Bath joined in. Bright young army pilots, smartly attired in their flying dungarees, the group brought out a pack of cards. "Flash (teen-patti)," they asked. There were four other pilots in the room plus two air force officers. The pilots had flown five sorties that day, from sunrise to sunset. 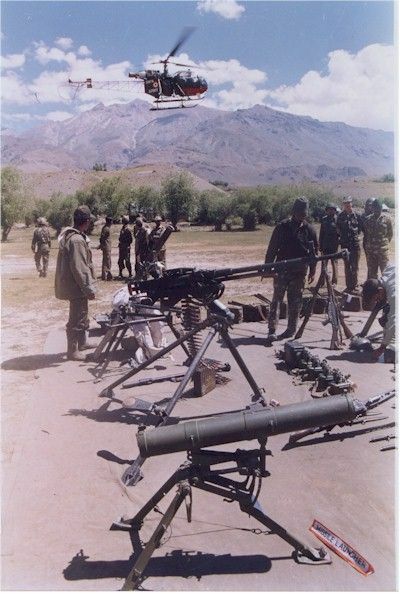 As soon as they brought the casualties to the Kargil helipad, the ambulance rushed to the helicopter and ferried the injured, bleeding and often moaning soldiers to the military clinic. There were times that a soldier ran behind the stretcher carrying the severed limb of an injured soldier. The life of the chopper pilots and the hospital staff was tough. There were times when pilots themselves washed the blood off the seat and the floor of the helicopter after dropping the injured soldier, before flying back to bring in more. And then there were times that the helicopters were being used as a hearse, bringing in dead soldiers from the battlefield to Kargil and Matayin, to be driver down to Srinagar later. And there were nights when the pilots could not eat because all day long they had ferried dead bodies. The Cheetah helicopters, which were called the lifeline of the battlefield, were also called flying coffins. "Imagine buddy, how we fly, this single engined bird, through a hail of Stinger missile fire, adverse wind and visibility conditions, above its endurance level. We are doing it because our brothers, fighting down there, depend on us," said a young pilot that night. Arms and ammunition captured from Pakistani invaders on display. A Heavy Machine Gun (HMG) and an American made Light Anti-armour Weapon (LAW). An Army Cheetah flies off in the background. 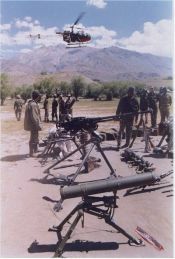 A Pakistan Army Type-59 130 mm gun at Mushung (05.Jun.1999) during the Kargil War. 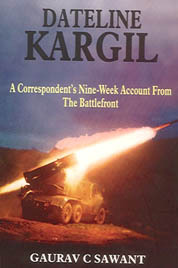 Pakistani troops were able to bring down effective artillery fire on Indian positions through much of the conflict, since they commanded all heights.